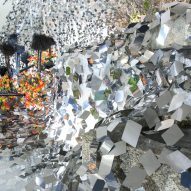 Over 40,000 shards of polished steel make up this installation by Nendo, which is designed as an "ivy of mirrors" spreading across a Japanese flower-arranging school. 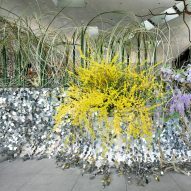 The Sogetsu School of Ikebana celebrating its 90th anniversary and decided to commemorate the event by putting on an exhibition titled Hana So (Fireworks). 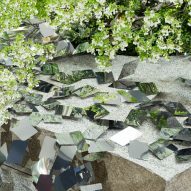 For the exhibition, the school's headteacher Akane Teshigahara commissioned Nendo to create a site-specific installation that would span the first floor of Tokyo's Sogetsu Plaza, where the school is based. This space was designed as a stone garden by landscape architect and artist Isamu Noguchi, and is dominated by grey-toned rock that has been carved into different surfaces. 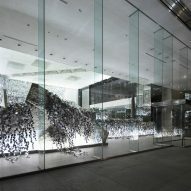 "The biggest challenge was how to transform the space into an inspiring and exciting environment," said Teshigahara. "After a lot of thinking, I decided to entrust the venue design to design office Nendo, led by world-renowned designer Oki Sato." 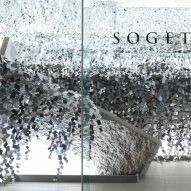 Nendo said it had worked with an entirely site-specific approach, designing the installation in response to the features of Sogetsu Plaza. 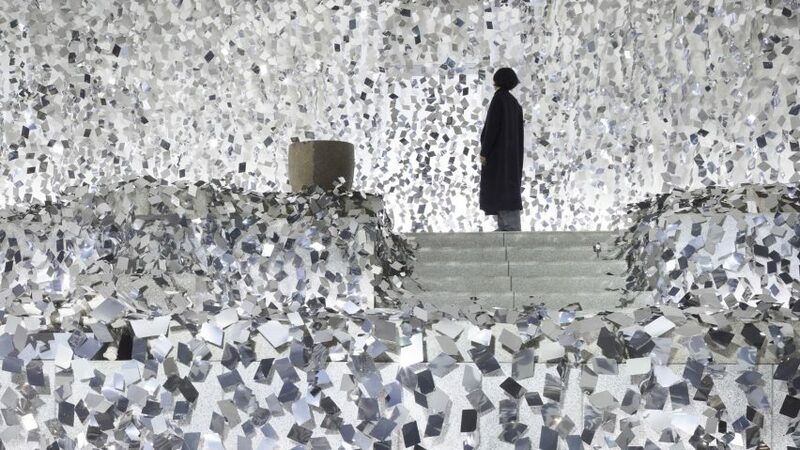 "Normally, the pieces for exhibitions are decided in advance, and the space is designed to accentuate those elements," said Nendo. 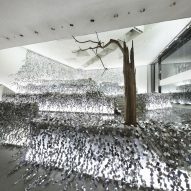 "But for this special occasion, the client proposed to reverse the approach by using the design of the space as an inspiration and to create the pieces that would be exhibited there." 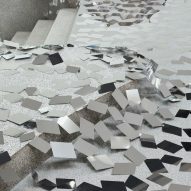 For the installation, Nendo cut sheets of stainless steel into 40,000 rhombus-shaped pieces, or "ivys". 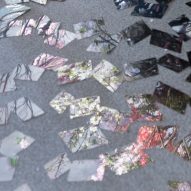 Each shape was then individually placed across the stone garden, creating a mirrored landscape that reflects its surroundings. 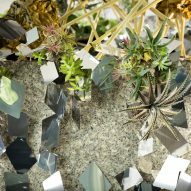 "The ivy would reflect the surroundings while also revealing glimpses of the texture and appearance of the stone garden beneath it, and the diffused reflections of the colours and outlines of the exhibited ikebana flowers would produce a kaleidoscopic visual effect," said the studio. 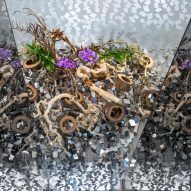 "The addition of this extra layer between these two works – the ikebana flowers and the stone garden – would create a harmony between them as if the flowers were gently enfolding the stone garden." 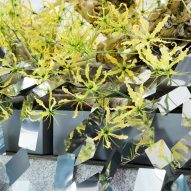 As well as its vast array of products, Oki Sato's studio has become known for its impressive installations that often take a minimal approach in terms of materials and colours. 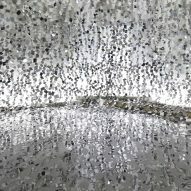 For its exhibition at this year's Milan design week, the studio presented a roomful of mountain-like partitions that was originally shown in Stockholm several years ago. Sato was the number-one ranked designer on Dezeen Hot List in 2016, and the only one to break into the overall top 20. The Japanese designer once told Dezeen that working on 400 products at a time relaxes him.